J J’s Lucky Train is the leading son of Silver Train, a multiple graded stakes winner who earned $1,259,345 in his career. Silver Train’s most notable victories came in the Breeders’ Cup Sprint (Gr. 1) and Jerome Handicap (Gr. 2) at 3 and the Metropolitan (Gr. 1) and Tom Fool (Gr. 2) Handicaps at 4. 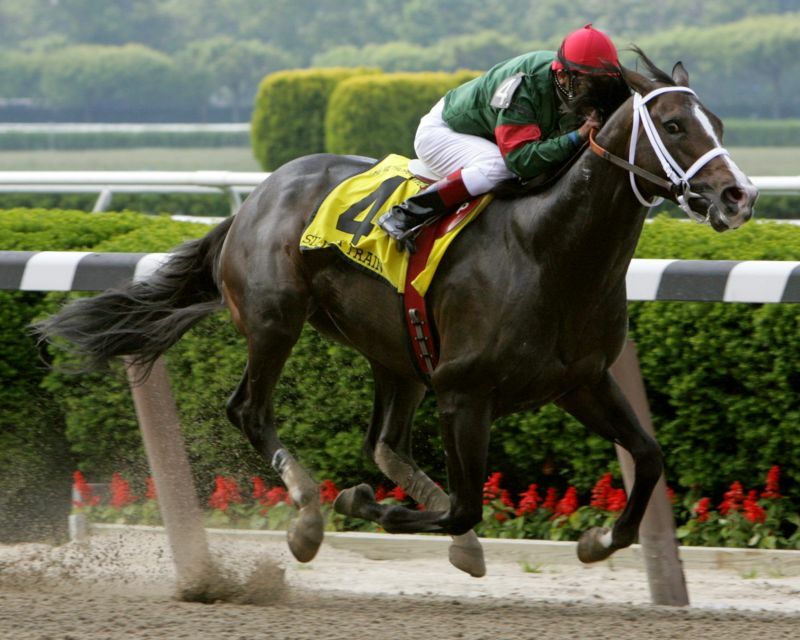 Silver Train had success as a stallion as well, with offspring earning over $3,000,000 annually in the years 2011-2013. Unfortunately, Silver Train died of pneumonia in December, 2013. More information about Silver Train can be found at his website, www.silvertrainsire.com. Silver Train was sired by Old Trieste, a multiple graded stakes winner of $847,944, and was produced from the Cormorant mare Ridden in Thestars. 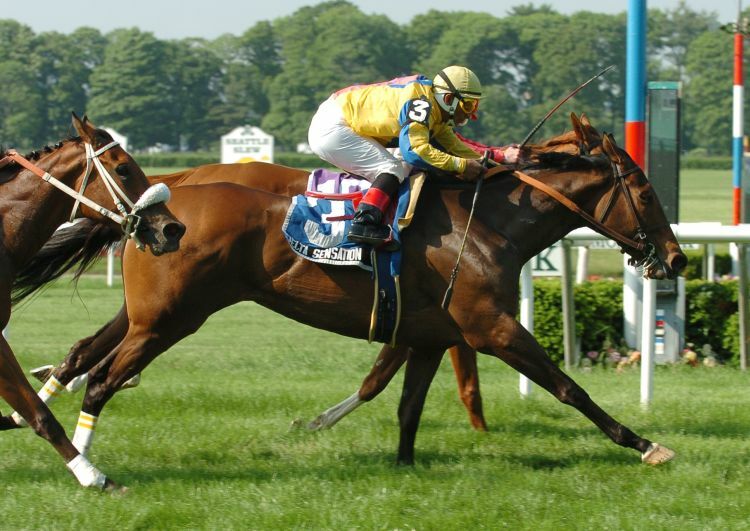 Old Trieste followed his success on the racetrack with a brief but successful career at stud. Out of 194 foals sired by Old Trieste, 175 (90%) were runners, 128 (66%) were winners, and 15 (8%) were stakes winners. His AEI is 1.64. Old Trieste’s brilliant career was cut short when he succumbed to acute laminitis at age 8. J J’s Lucky Train was produced from the Thunder Gulch mare Delta Sensation. Delta Sensation earned $167,226 on the racetrack, running the majority of her twelve starts in stakes company. She won the Terpsichorist Stakes going a mile and a sixteenth on the turf and was third in the Pebbles Stakes (Gr. 3) going a mile and an eighth on the turf. She comes from a durable female family with her dam Ski At Dawn having started 61 times and her second dam, stakes placed First of Dawn, having started 50 times. J J’s Lucky Train has a pedigree that features the three-quarters brothers Nijinsky II and Far North, as well as a daughter of their close relative Storm Bird. 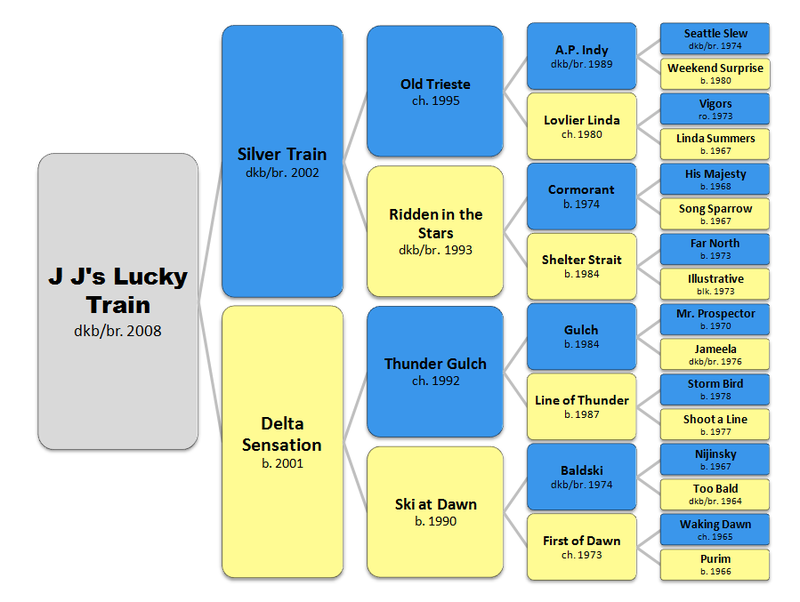 This suggests that J J’s Lucky Train should be very well-suited by mares descending from Storm Bird’s son, Storm Cat (who is broodmare sire of a Silver Train stakes winner). Several sons of Storm Cat appear as the broodmare sires of A.P. Indy line stakes winners, including Cat Thief, Catienus, Exploit, Forest Wildcat, Forestry, Freud, Giant’s Causeway, Harlan and his sons Harlan’s Holiday and Menifee, Hennessy (sire of Johannesburg, Wiseman’s Ferry and Henny Hughes), Sir Cat, Storm Boot, Storm Creek, Tabasco Cat, Tactical Cat and Tale of the Cat (sire of Lion Heart). It might also be interesting to bring in Storm Cat through Stormy Atlantic and Stormin Fever, who would give inbreeding to Seattle Slew. Storm Bird might also be introduced through Summer Squall (sire of Charismatic), a half-brother to A.P. Indy, and broodmare sire of an A.P. Indy line Champion Two-Year-Old. J J’s Lucky Train’s grandsire, Old Trieste, crossed very well with Northern Dancer through Deputy Minister, getting a stakes winner out of a mare by that horse, a grade one winner out of mare by The Prime Minister, and a stakes winner out of a mare by Silver Deputy. Other Deputy Minister line stallions that have produced A.P. Indy line stakes winners include Awesome Again (sire of Ghostzapper), Dehere, Mr. Purple, Mr. Sparkles, Touch Gold and Victory Speech. It could also pay to re-introduce Nijinsky II through such as Royal Academy, Strawberry Road, Sky Classic, Shadeed, Alydeed, Encino and Sword Dance, and Nijinsky II’s three-quarters brother The Minstrel, who is sire of Palace Music, Opening Verse and Peterhof. Crossed over Mr. Prospector line mares, Silver Train sired stakes winners from daughters of Smart Strike (sire of Curlin and English Channel), Prospect Bay and Trippi (by End Sweep, a son of Forty Niner, who could also be brought in through Distorted Humor, Banker’s Gold – who both look particularly promising – Tactical Advantage, Gold Fever, Coronado’s Quest, Editor’s Note, Twining, Roar, Flower Alley and Sharp Humor). Old Trieste, the grandsire of J J’s Lucky Train, sired stakes winners out of mares by the Mr. Prospector line stallions Kingmambo (sire of Lemon Drop Kid, who is out of a three-quarters brother to A.P. Indy), Woodman and Prospect Bay (by Crafty Prospector). There is also a graded stakes winner by a son of Old Trieste out of a mare by Machiavellian (sire of Street Cry; grandsire of Street Sense and Street Boss). We can also note that Silver Train has a graded stakes winner with a second dam by Seeking the Gold (sire of Mutakddim, Petionville, Editor’s Note and Bob and John). Any introduction of the Mr. Prospector/Northern Dancer cross should be positive, and can be introduced through such as Not For Love, Marquetry, Fusaichi Pegasus (sire of Roman Ruler), Smoke Glacken, Speightstown and Birdstone (both giving inbreeding to Storm Bird), Broken Vow (bringing in Nijinsky II) and Northern Afleet (sire of Afleet Alex). Silver Train has a graded stakes winner out of a mare by Mt. Livermore, and Old Trieste has a stakes winner out of a mare by that horse’s son, Peaks and Valleys. This would suggest trying other Mt. Livermore sons, such as Orientate, Housebuster, Lucky Lionel, Subordination and Pyramid Peak. Mt. Livermore is by Blushing Groom, and it would also be worth considering introducing Blushing Groom through Cherokee Run and Rahy. 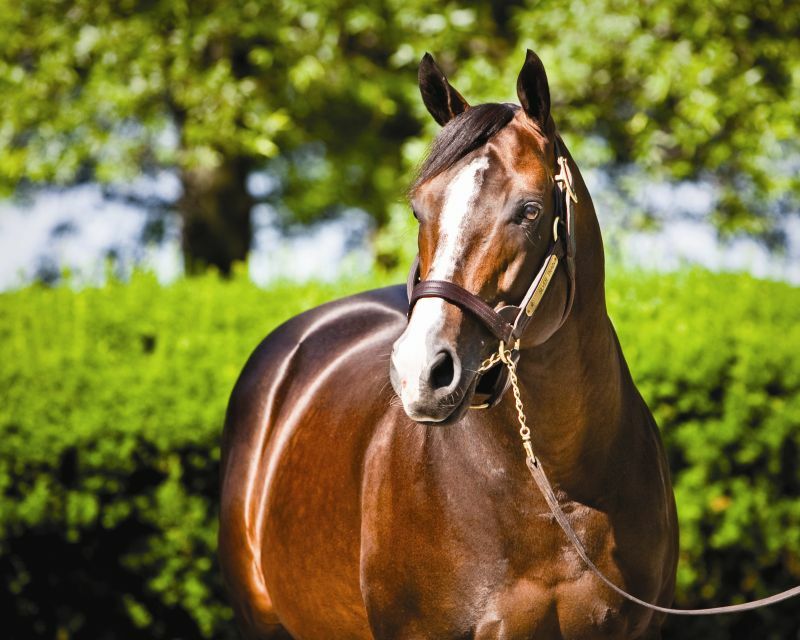 Silver Train is sire of stakes winners out of mares by Dynaformer (sire of Purim and Blumin Affair) and his three-quarters brother, Sunshine Forever, both sons of Roberto, who might also be brought in through Darby Creek Road (closely related to Dynaformer and Sunshine Forever), Kris S. (and his sons, Arch, Rock Hard Ten, Prized, You And I and Kissin Kris), Red Ransom and Major Impact. Roberto is a Hail to Reason line stallion, and from the Halo branch of that line Old Trieste sired a stakes winner out of a mare by Southern Halo (sire of More Than Ready). Stop the Music is a Hail to Reason horse bred on very similar lines to Halo, and there is a Silver Train stakes winner out of a mare by Take Me Out (by Cure the Blues, a son of Stop the Music). Cure the Blues is also sire of American Chance (who would give inbreeding to Seattle Slew) and Tethra, and Stop the Music could also be brought in through Temperence Hill. We can also note stakes winners from this male line out of mares by Lord At War and Holy Bull (sire of Macho Uno and Flashy Bull).